Red Multicolour Granite from India is the world famous variety for natural building stone. This Granite comes in rich red color with Brown, yellow, white, lavenders speckles and waves. Medium hardness, resistance to scratch, durability, smooth finishing, heat resistance, and durability makes it famous globally. Red Multicolour name is result of rich deep red color. Red Multicolour Granite is suitable for both interior and exterior use furthermore is frost resistant and with a constant polish. Kushalbagh Marbles is the leading manufacturer, supplier and exporter of Red Multicolour Granite. We are exporting Red Multicolour Granite to over 20 countries all over the world. We supply Slabs, Tiles and other cut sizes of Red Multicolour Granite. 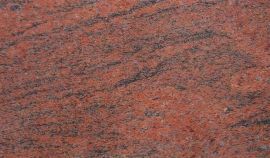 To fill out the enquiry form, please click here to get the best quotation for Red Multicolor Granite.